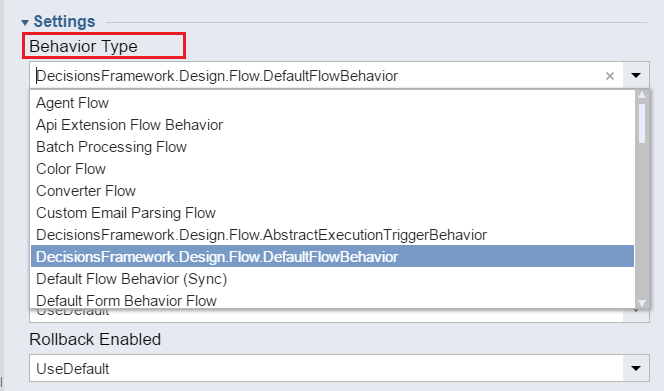 This document overviews Flow Settings	in Flow Designer. Note:	to learn how to build your first Flow, please click here . In the Flow Designer	we locate and expand Settings	on the Properties	panel. In Behavior Type	drop-down list we can set desirable Flow Behavior	. A Flow Behavior acts like an interface definition for a Flow . It can enforce expected inputs and outputs as well as create the expected inputs when the behavior is assigned. Stop Recursion at	(default 20000) . This setting prevents Flow from an infinite loop and overflow memory. Note: this number should be increased if we intend to process more than 20000 records. Storage Policy	sets the way Flow Data	is going to be stored in database if the Flow is abandoned. Snapshot	is lighter on processing but heavier on storage space in database. Clear Policy On Exception	. When a Flow ends on an exception, by default it does not clear the Flow data that may have been saved in the database. We can override this with the Clear Policy On Exception setting. Use Default:	set in System>Administration>Settings> Designer Studio Settings>Flow Designer. 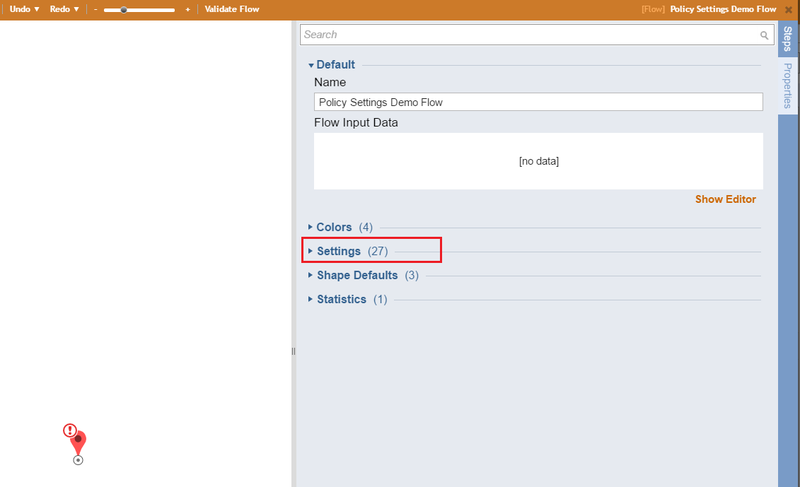 Rollback Enabled	sets if we can rollback Flow data based on ‘Clear Policy On Exception’ setting. The Keep Active Time Span	setting determines how long a Flow remains in the ‘running state’ if it is stalled on a sync step. Once it is no longer active the Flow becomes abandoned. 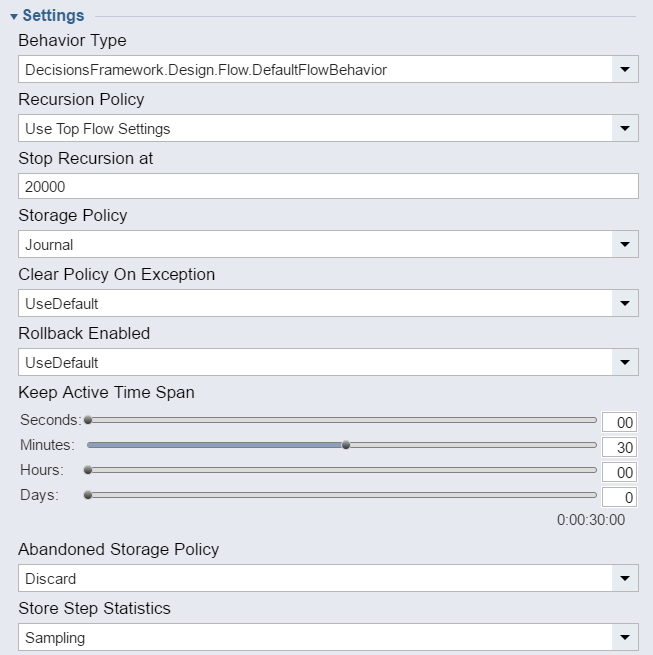 Abandoned Storage Policy	defines if Flow data should be Saved	or Discarded	if Flow is ‘abandoned’ . Store Step Statistics	setting defines if Step data should be stored in database.